The daily hubbub of the stock market has changed dramatically. The past 20 years, or 10, or even two have transformed the environment for public companies to raise and maintain equity capital. As investor relations professionals, we must study up. This page is offered as a resource on the new world of trading, and points you to other resources to learn about changing market structure and activity. 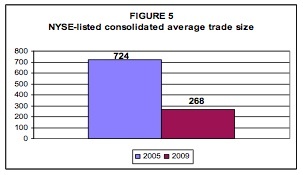 In response to the 2007-09 market meltdown, the Securities and Exchange Commission is embarking on a broad review of equity market structure – with an eye to regulating venues and techniques. The SEC summarizes its approach in a press release, but the most informative read is the concept release itself (PDF file). Banning flash orders, which enable a person who has not publicly displayed a quote to see orders less than a second before the public can trade with those orders. 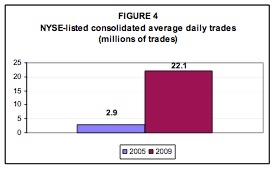 This gives an advantage to automated trading operations. Strengthening transparency requirements for nonpublic trading interest, including “dark pools” of liquidity, alternative trading systems that match orders privately and do not display quotations to the public. Launching a new SEC market structure initiative to strengthen the risk management controls of broker-dealers that provide market access. The SEC is accepting comments, analysis and data submissions on all aspects of market structure – and its proposals – online or on paper, by April 21, 2010. 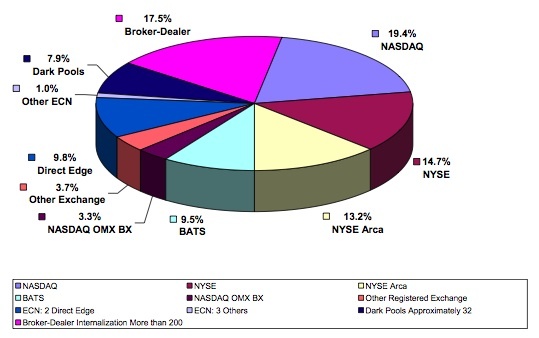 The transformation of equity trading has encompassed all types of U.S.-listed stocks. In recent years, however, it is perhaps most apparent in stocks listed on the New York Stock Exchange (“NYSE”), which constitute nearly 80% of the capitalization of the U.S. equity markets. 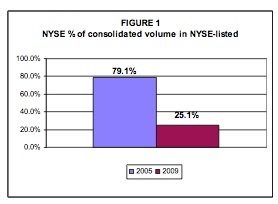 In contrast to stocks listed on the NASDAQ Stock Market LLC (“NASDAQ”), which for more than a decade have been traded in a highly automated fashion at many different trading centers, NYSE-listed stocks were traded primarily on the floor of the NYSE in a manual fashion until October 2006. 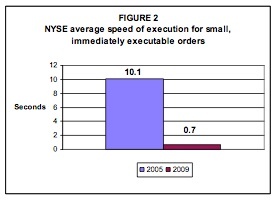 At that time, NYSE began to offer fully automated access to its displayed quotations. An important impetus for this change was the Commission’s adoption of Regulation NMS in 2005, which eliminated the trade-through protection for manual quotations that nearly all commenters believed was seriously outdated. In the spirit of educating ourselves, a pretty good book on the emergence of automated trading is Nerds on Wall Street: Math, Machines & Wired Markets by David Leinweber (Wiley, 2009). Another, which is more skeptical, is A Demon of Our Own Design: Markets, Hedge Funds, and the Perils of Financial Innovation by Richard Bookstaber (Wiley, 2007). The SEC’s concept release seeks out public comment on three issues related to the equity markets – the performance of the current market structure, high-frequency trading, and undisplayed liquidity – as well as any other aspect of the markets. I hope this summary, which only skims the surface of changing market structure, is helpful. Please feel free to comment on this page, or contact me directly.